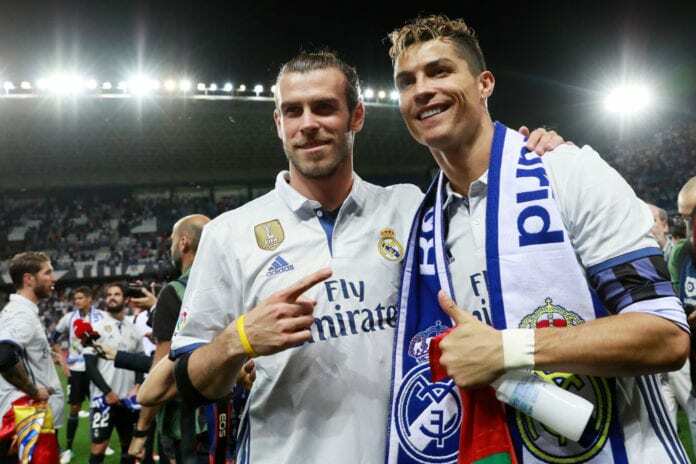 Gareth Bale declared that he views Cristiano Ronaldo as an “incredible player” and insists there were never any problems in their time together at Real Madrid. The duo played alongside each other in Madrid for five years, where they helped Los Blancos win an unprecedented four Champions League titles, La Liga and the Copa del Rey. Despite the success on the pitch, however, there were rumours going about suggesting that Bale had an uneasy relationship with Ronaldo before the latter sealed a €112m transfer to Juventus last summer. In Ronaldo’s absence, Bale was tipped to become the main man at the Santiago Bernabeu but he’s instead found himself struggling for regular opportunities in what has been another frustrating season for Real’s record signing. However, the 29-year-old insists things were always good with Ronaldo and revealed the respect he holds for his former team-mate following another prolific campaign at the age of 34. “Cristiano is an incredible player, I thoroughly enjoyed playing with him,” Bale told BT Sport. “Obviously the media try and hype up these problems which were never there. We got on really well. The former Tottenham star also opened up on his admiration for Arsenal legends Thierry Henry and Dennis Bergkamp, along with Wales manager Ryan Giggs during his Manchester United playing days. “I used to watch Arsenal a lot,” said Bale. On Giggs, he added: “He was a massive influence. He was my hero growing up, obviously being Welsh, left-footed, I looked up to him a lot, I used to enjoy watching him play.